Finlay Graham Property are delighted to bring to the sales market this excellent 3 bedroom house located on the Knock Dual Carriageway, Belfast between the Cregagh and Castlereagh Roads. This property will be of particular interest to young professionals, familes or couples looking for quality accomodation in a vibrant residential area with access to transport links. The property is situated in a largely family orientated area with both primary and secondary / grammar schools close by. There are many amenities only a stones throw away to include a multitude of coffee shops restaurants and boutiques. Additionally the City Centre and Forestside Shopping Centre are accessed by excellent public transport links. We would expect the property to be of particular interest to first time buyers, families looking for some extra space, or perhaps couples looking to downsize to a quiet residential area. You enter the property from the front door and this leads to the hallway. Just off the hall is the living room with stunning views over Belfast. From the hallway is the open plan kitchen and sun room. Both have recently been repainted and new laminate flooring installed. The first floor has an open and bright landing area. Off the landing are 3 bedrooms and a modern family bathroom. 2 of the bedrooms are spacious doubles, one overlooking the front of the property, and the other onto the rear. The third bedroom could be used as a single bedroom, nursery or study room alike. The bathroom has a full size bath with electric shower over, ideal for families. Also included is a wash hand basin and WC. 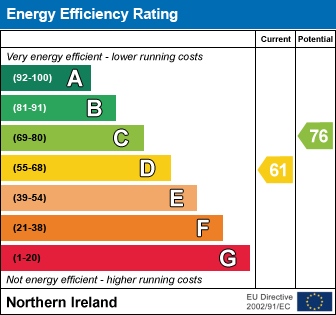 The property benefits from oil fired central heating (OFCH) and uPVC double-glazing throughout. Visit www.finlaygrahamproperty.com for further details.